Hejira is the eighth studio album by Canadian singer-songwriter Joni Mitchell. Characterized by lyrically dense, sprawling songs, and the fretless bass playing of Jaco Pastorius, Hejira marked Mitchell's turn towards the jazz-based music she would implement on later recordings. The album did not sell as well as its predecessors, peaking at No. 22 in her native Canada. It reached No. 13 on the Billboard 200 pop album chart in the United States, where it was certified gold by the RIAA, and No. 11 in the UK, where it attained a silver certification. Critically, the album was generally well received, and in the years since its release, Hejira has been considered one of the high marks of her career. According to Mitchell, the album was written during or after three journeys she took in late 1975 and the first half of 1976. The first was a stint as a member of Bob Dylan's Rolling Thunder Revue in late 1975. During this time period, she became a frequent cocaine user, and it would take several years for her to kick the addiction. During some of her solo journeys, Mitchell donned a red wig, sunglasses, and told the varying strangers she met that her name was either "Charlene Latimer" or "Joan Black." Despite the disguise, Mitchell was still sometimes recognized. Dominated by Mitchell's guitar and Pastorius's fretless bass, the album drew on a range of influences but was more cohesive and accessible than some of her later more jazz-oriented work. "Coyote", "Amelia", and "Hejira" became concert staples especially after being featured on the live album Shadows and Light alongside "Furry Sings the Blues" and "Black Crow". The album title is an unusual transliteration of the Arabic word more commonly rendered as Hegira or Hijra, which means "rupture", usually referring to the migration of the Islamic prophet Muhammad (and his companions) from Mecca to Medina in 622. She later stated that when she chose the title, she was looking for a word that meant "running away with honor." She found the word "hejira" while reading the dictionary, and was drawn to the "dangling j, like in Aja... it's leaving the dream, no blame". Mitchell has described the album as "really inspired... there is this restless feeling throughout it... The sweet loneliness of solitary travel", and has said that "I suppose a lot of people could have written a lot of my other songs, but I feel the songs on Hejira could only have come from me." Hejira opens with "Coyote", about a one-night stand with a ladies' man, speculated by several biographers to be playwright and actor Sam Shepard. Mitchell would later perform the song with The Band at their farewell concert, which was eventually released under the title The Last Waltz (1978). The second track on Hejira, "Amelia", was inspired by Mitchell's breakup with Guerin, and described by her as almost an exact account of her experience in the desert. The song interweaves a story of a desert journey (the "hejira within the hejira") with the famous aviator Amelia Earhart who mysteriously vanished during a flight over the Pacific Ocean. Mitchell has commented on the origins of the song: "I was thinking of Amelia Earhart and addressing it from one solo pilot to another... sort of reflecting on the cost of being a woman and having something you must do." The song, each verse of which ends with the refrain "Amelia, it was just a false alarm", repeatedly shifts between two keys, giving it a constant unsettled feeling. "Furry Sings the Blues", with Neil Young on harmonica, is an account of Mitchell meeting the blues guitarist and singer Furry Lewis in Beale Street, Memphis during a period when the surrounding area was being demolished. Lewis was displeased with Mitchell's use of his name. Mitchell would return to the song live in concert throughout the years. After not performing live since 2002, Mitchell played "Furry Sings the Blues" (as well as "Don't Interrupt the Sorrow" from The Hissing of Summer Lawns and "Woodstock" from Ladies of the Canyon) during her birthday tribute at Massey Hall on June 18 and 19, 2013. This was Mitchell's final public performance to date. "A Strange Boy" recounts the affair Mitchell had with one of the men she was traveling with from Los Angeles to Maine; he was a flight attendant in his thirties who lived with his parents. 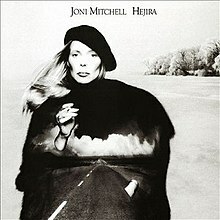 "Hejira" is about Mitchell's reasons for leaving John Guerin, and Mitchell described it as probably the toughest tune on the album to write. It features the bass work of Pastorius, who was inspired by Mitchell's use of multi-tracking with her guitar to mix four separate tracks of his carefully arranged bass parts, having them all play together at certain points of the tune. Side two of Hejira begins with the epic "Song for Sharon", which at eight minutes and 40 seconds stands as the longest track on the album. The lyrics deal with the conflict faced by a woman who is deciding between freedom and marriage. The song references the places Mitchell went during her trip to New York City, including scenes at Mandolin Brothers in Staten Island and a visit to a fortune teller on Bleecker Street. The song was allegedly written while Mitchell was high on cocaine at the end of her visit to the city. The namesake of the song was her childhood friend Sharon Bell, who studied voice and wanted to be a singer when she was young but married a farmer; Mitchell wanted to be a farmer's wife, but ended up becoming a singer. The song also mentions the blowout fight and abandoned midwestern tour that served as the death knell for Mitchell's relationship with Guerin: "I left my man at a North Dakota junction, and I came out to the Big Apple here to face the dream's malfunction." According to biographer Sheila Weller, "Song For Sharon" also makes a coded reference to the March 1976 suicide of Jackson Browne's wife, fashion model Phyllis Major. Browne and Mitchell had a brief, "high-strung" affair in 1972; on at least one occasion, Browne allegedly physically abused Mitchell. After their relationship dissolved, Browne quickly married Major. Although Major had died from a barbiturate overdose, Mitchell sang "A woman I knew just drowned herself", and questioned if her suicide was a means of "punishing somebody". "Black Crow"'s lyrics deal with the practical difficulty for Mitchell of traveling from her second home on British Columbia's Sunshine Coast. "Blue Motel Room" was written at the DeSoto Beach Motel in Savannah, Georgia. The song was inspired by the first breakup of the on-again-off-again relationship between Mitchell and Guerin. The lyrics express Mitchell's hopes of rekindling their relationship, and she tells her love interest to rebuff any other suitors: "Tell those girls that you've got German Measles, honey tell 'em you've got germs." "Refuge of the Roads" was written about a three-day visit that Mitchell had made to the Buddhist meditation master Chögyam Trungpa in Colorado on her way back to Los Angeles. Mitchell would later say that "Refuge of the Roads" was one of her own favorite songs, and would re-record the tune, along with "Amelia" and "Hejira", with a full orchestra for her 2002 album Travelogue. The album was released in November 1976 by Asylum. Commercially the album did not do as well as its two predecessors. Despite reaching #13 on the Billboard 200 pop album chart and being certified Gold, it failed to get significant airplay on commercial radio. Reviewing for Rolling Stone, Ariel Swartley felt that Mitchell had abandoned melodies and memorable tunes in favour of "new, seductive rhythms" and "lush guitars", with the resulting sound, despite its "apparent simplicity", as "sophisticated and arresting as anything she's done". Village Voice critic Robert Christgau was impressed with the way that "Mitchell subjugates melody to the natural music of language itself". In 1991 Rolling Stone placed the cover at No. 11 on its list of best album covers. ^ Moe, Doug (31 March 2006). "Joni Mitchell Library - Joni Mitchell and Lake Mendota: Capital Times (Wisconsin), March 31, 2006". www.jonimitchell.com. Retrieved 20 November 2018. ^ a b c d e f g h i j k Fisher, Doug (October 8, 2006). "The trouble she's seen". Ottawa Citizen. Retrieved November 30, 2015. ^ Ruhlman, William (February 17, 1995). "From Blue to Indigo". Goldmine. Retrieved November 30, 2015. ^ Mercer, Michelle (2009). Will You Take Me As I Am: Joni Mitchell's Blue Period. Simon and Schuster. pp. 182–. ISBN 978-1-4165-6655-7. Retrieved 25 June 2017. ^ Weller, Sheila (2008). Girls Like Us: Carole King, Joni Mitchell, Carly Simon -- and The Journey of a Generation. New York, NY: Atria Books. p. 412. ISBN 0743491483. ^ a b Breese, Wally (January 1998). "Biography: 1976–1977 Refuge of the Roads". Jonimitchell.com. Retrieved November 30, 2015. ^ Mitchell, Joni (December 1987). "The Life and Death of Jaco Pastorius". Musician. Retrieved November 30, 2015. ^ a b Daily Motion video: "Joni Mitchell: Painting With Words and Music." ^ a b Hilburn, Robert (December 8, 1996). "Both Sides, Later". Los Angeles Times. Retrieved November 30, 2015. ^ Friedman, Roger (April 1, 2008). "Joni Mitchell's '70s Suicide Attempt". Fox News. Retrieved February 21, 2017. ^ Levitin, Daniel (1996). "A conversation with Joni Mitchell" (PDF). Grammy Magazine. Vol. 14 no. 2. Retrieved 30 November 2015. ^ "newsobserver.com |On the Beat: David Menconi on music – Elvis forever and ever, amen". Blogsarchive.newsobserver.com. Archived from the original on 2009-04-02. Retrieved 2012-02-21. ^ Rolling Stone article: "Furry Lewis is Furious at Joni." February 24, 1977. ^ Suchow, Rick (December 2011). "Jaco at 60: his legacy lives on". Bass Musician. Retrieved November 30, 2015. ^ Ohrstrom, Lysandra (July 15, 2008). "Mandolin 'Mecca' on Staten Island". The New York Observer. Retrieved November 30, 2015. ^ Aikins, Mary (July 2005). "Heart of a Prairie Girl". Reader's Digest. Retrieved 30 November 2015. ^ a b Weller, Sheila (2008). Girls Like Us: Carole King, Joni Mitchell, Carly Simon -- and The Journey of a Generation. New York, NY: Atria Books. pp. 410–411. ISBN 0743491483. ^ Weller, Sheila (2008). Girls Like Us: Carole King, Joni Mitchell, Carly Simon -- and The Journey of a Generation. New York, NY: Atria Books. p. 407. ISBN 0743491483. ^ a b Weller, Sheila (2008). Girls Like Us: Carole King, Joni Mitchell, Carly Simon -- and The Journey of a Generation. New York, NY: Atria Books. p. 415. ISBN 0743491483. ^ Ehrlich, Dimitri (April 1991). "Joni Mitchell". Interview. Retrieved April 1, 2014. ^ Cleary, David (2011). "Hejira – Joni Mitchell | AllMusic". allmusic.com. Retrieved 19 July 2011. ^ a b Christgau, Robert (1981). "Consumer Guide '70s: M". Christgau's Record Guide: Rock Albums of the Seventies. Ticknor & Fields. ISBN 089919026X. Retrieved March 8, 2019 – via robertchristgau.com. ^ a b c "Joni Mitchell Hejira". Acclaimed Music. Retrieved 2014-03-18. ^ Hopper, Jessica (November 9, 2012). "Joni Mitchell studio albums review". pitchfork.com. Retrieved March 18, 2014. ^ Brackett, Nathan; Hoard, Christian, eds. (2004). "Joni Mitchell". The New Rolling Stone Album Guide. London: Fireside. pp. 547–548. ISBN 0-7432-0169-8. Retrieved 8 September 2009. Portions posted at "Joni Mitchell > Album Guide". rollingstone.com. Archived from the original on July 31, 2011. Retrieved June 2, 2015. ^ Bryant, Christopher (26 March 2009). "Hejira • Joni Mitchell". polarimagazine.com. Retrieved 12 November 2015. ^ Ariel Swartley (2011). "Hejira by Joni Mitchell". rollingstone.com. Retrieved 19 July 2011. ^ "Rolling Stone's 100 Greatest Album Covers". Rate Your Music. 1991-11-14. Retrieved 2012-02-21.